Mojang is implementing a plan that'll give players the power to become officially licensed Minecraft mod developers. 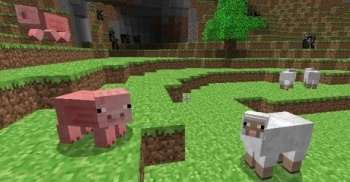 One of the primary issues Minecraft creator Markus "Notch" Persson has been deliberating over for the final version of the game is how he wants to handle mods, a term typically used to refer to user-made alterations of a game's basic components. For example, this. He and Mojang have come to a decision on the matter which will create an official Minecraft mod developer license deal. Notch recently wrote on his blog that two major issues were making him hesitant to create an official Minecraft mod API. They include "preventing people from making money off [Mojang's] work (unless they have a license deal with [Mojang])" and "making sure mods don't break with each game update." So, official mod developers will now have to sign up for a license deal. Problem solved. As a licensed mod developer, users will be able to download Minecraft's source code direct from Mojang, and it'll be updated anytime a change is made. Each developer, which could refer to a team of people, will receive a unique certificate to sign his/her/their mods. This will enable players to know who's making what and to return to developers they enjoy. The plan was originally going to cost money to weed out those that weren't serious about mod making, but a negative response caused Notch to scratch the monetary entry fee about 15 minutes after it was first announced. Notch adds that Mojang might end up purchasing the best mods and selling them, possibly through a mod marketplace, or it might integrate certain mods into the main game. There's no timetable for when this system will be in place, but it'll likely come before or around Minecraft's official release date of November 11, 2011.